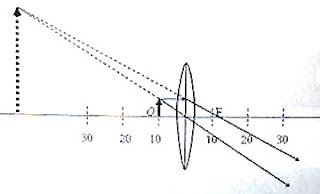 To draw the ray diagram two rays are considered: One ray proceeding parallel to the principal axis gets refracted at the lens and passes through the principal focus F. Another ray proceeding through the optic centre of the lens is undeviated. (b) The image is virtual since the rays do not rally converge at the image, but only appear to diverge from it. The image is magnified and erect as is evident from the ray diagram. Therefore, 1/si = 1/7.5 – 1/10 from which si = 30 cm. (d) The image is real since the image distance is positive. Now, find some multiple choice questions here.